Explorers of nationalities other than Dutch, English and French played minor roles in the country’s discovery. Alessandro Malaspina, an Italian in command of a Spanish expedition, explored Doubtful Sound in 1793; and in 1820 Fabian von Bellingshausen used Queen Charlotte Sound as a base on a Russian expedition exploring the southern polar waters. 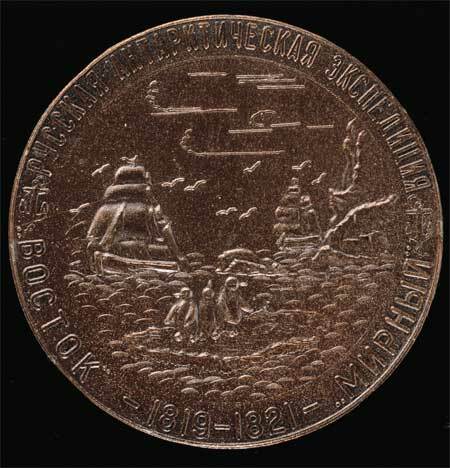 This medallion was issued to commemorate von Bellingshausen’s Antarctic expedition and shows two sailing ships, with penguins on an ice floe in the foreground.